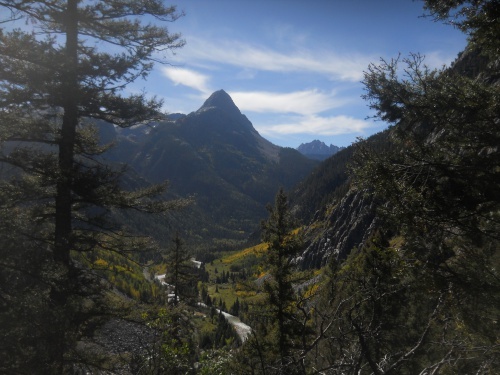 Another Long Walk: Day 26: Hiking into Silverton! September 19: It was a cold night, but a dry one. Knowing that I had a short 10-mile day into the town of Silverton, I decided to stay in my nice, warm sleeping bag and sleep in late, not hitting the trail until about 8:00. 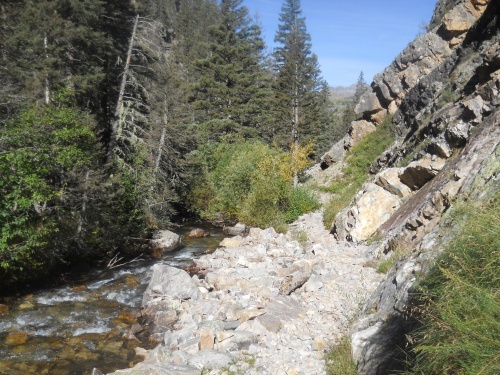 A couple of hours later, I made to the bottom where the Animas River flows from Silverton to Durango--at 8,920 feet above sea level, it's the lowest point of the entire trail since I left Salida nine days earlier. But the creek wasn't the most interesting part of the trail. No, is the was the narrow-gauge railroad track that went through. 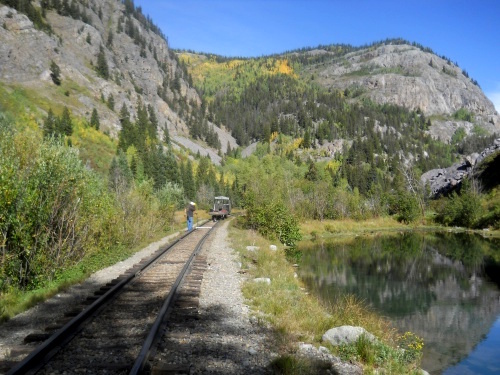 I'd heard stories about this train--a historic steam locomotive built in the 1880s that now shuttles tourists between Silverton and Durango, and there's an actual stop for it on the trail! I didn't have a train schedule, though, and wasn't entirely sure when the next train would go through in my direction, although Jared--one of the Indiana boys I met a few days ago said it was supposed to go through at 11:15 less than an hour away. I could wait for it, but it would mean I was subject to the train schedule on the way back as well and Jared warned that it was rather expensive for such a short ride. But, more relevant from my point of view, was that Molas Pass was another five miles down the trail and it was barely 10:00 am. 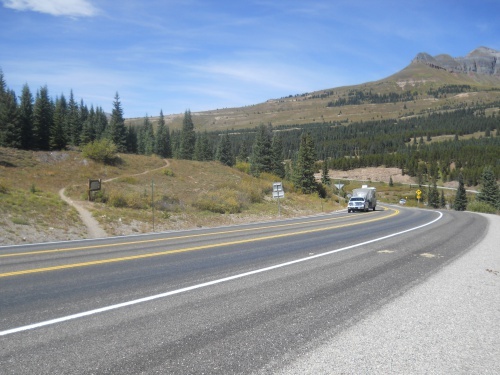 Molas Pass has a busy highway running through it that I could hitch a ride into town. I wouldn't be subject to a train schedule, and I'd already knock off another five miles of the 79.0 miles I had left to the end of the trail. Growing increasingly concerned about the winter-like conditions I've had to deal with, I figured I should get the miles in now while it was sunny and beautiful. If the weather were miserable, I might have been inclined to quit the day early. But it wasn't, so I didn't! 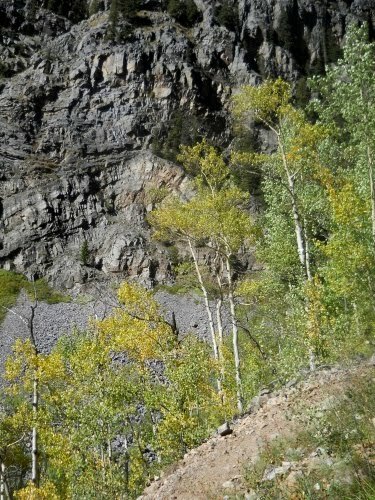 There were a few men working on the railroad track, tightening bolts and measuring the distance between the tracks, and a sign at the tracks pointed the Colorado Trail directly down the tracks. 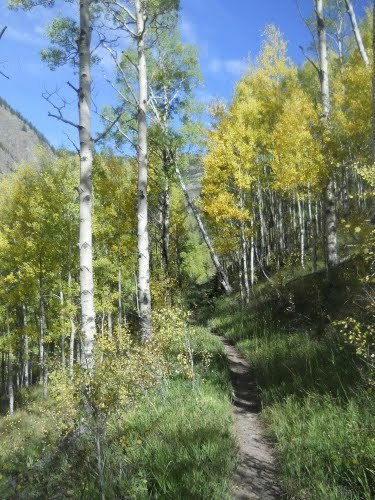 I was a little unsure about where the Colorado Trail went exactly. The sign appeared to point directly down the tracks, but I couldn't imagine that they'd really route the trail directly on the railroad tracks. Usually trails will cross a railroad track with giant warning signs about looking both way and being careful before stepping over the tracks. And I didn't really want the railroad workers to bust me for walking on the railroad tracks when I wasn't supposed to. But I couldn't find any other route for the trail and walked towards the workers asking them if this was the Colorado Trail. They assured me that it was, and that the trail would veer off into the woods on the other side in a short distance, which it did. But for about a minute, I walked directly on the railroad tracks because that's where the trail was! They've been working on the railroad... just to pass the time away! 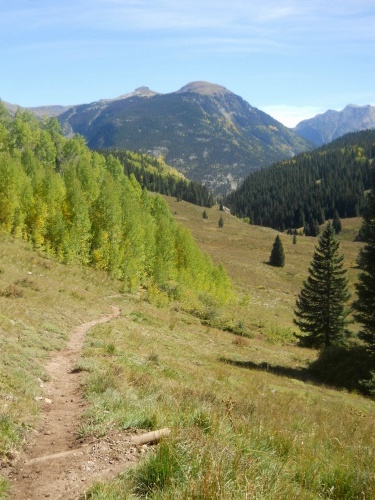 I took a short break by the Animas, eating a few snacks and filling up with water, then proceeded the long, steep climb to Molas Pass two thousand feet higher. Another reason not to take the train into Silverton: at least now I was hiking with a relatively light pack empty of food. When I left Silverton, I'd be weighed down with food and the climb up would feel a lot worse then! The views from this side of the tracks were absolutely breathtaking. 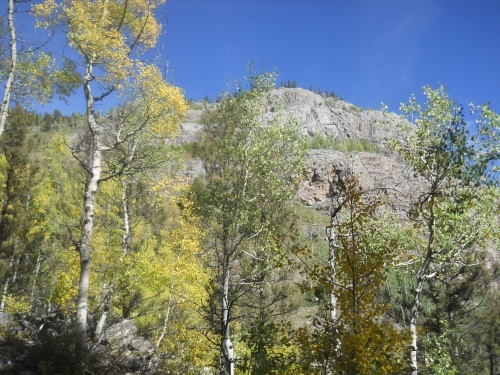 Coming down I was trapped in Elk Canyon with limited views, but now I was climbing up the ridge of another canyon with commanding views sprinkled with colorful aspen trees. Absolutely spectacular! 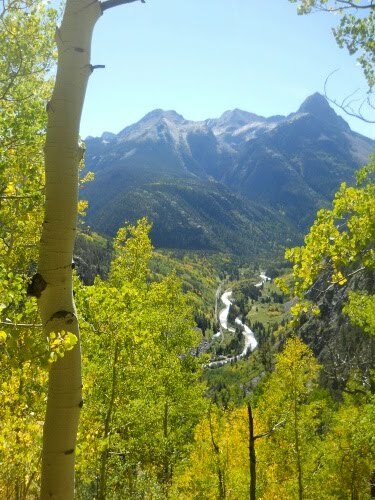 Views up the steep slope from the Animas River were spectacular! About an hour later, I looked back down into the canyon and I saw a cloud of smoke. Did the railroad workers accidentally start a forest fire or something? But I didn't see the railroad workers on the track anymore. 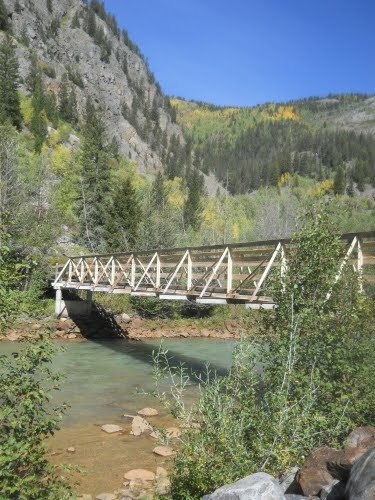 I could see the bridge where the Colorado Trail crossed the Animas River, but the railroad workers were gone. Then I realized the time and thought, it must be the train! It's a steam locomotive, after all, and they belch all sorts of pollutants. But where was the train? I didn't see a train. Then I saw it, rounding a curve and into view. From my perch up high, it wasn't a very good view of the train, but I was still strangely excited to see it and it belched more smoke into the air. A little part of me wished I had stopped and taken the train into Silverton, but it was too late for that now. I pulled out my fancy camera with the zoom lens to get a better view of the train and get some photos. Click! Click! Click! 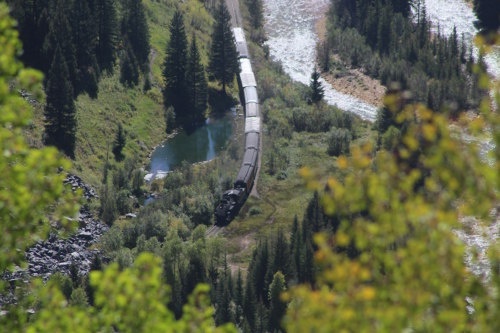 The train took several minutes to wind its up upriver--towards Silverton--and out of view, at which point I packed up my camera again and continued the hike. To Silverton! 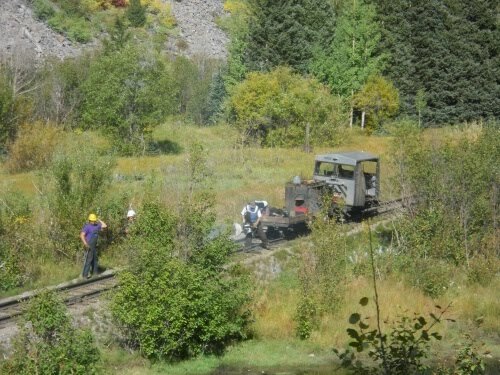 The old, historic steam locomotive pulling tourists between Silverton and Durango since the 1880s. 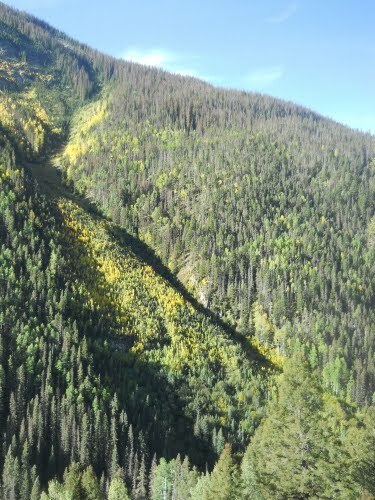 Shortly after the train, I left the ridge of the canyon. Had I been just a few minutes faster, I might have missed the train completely. 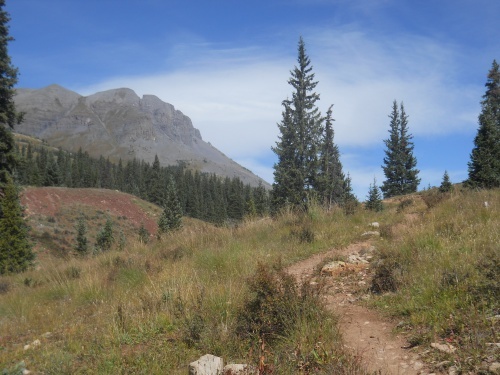 As I closed in on the Molas Pass Trailhead, I met a woman hiking by herself on the trail who asked if I was hiking the Colorado Trail. Yes.... And we ended up chatting for a few minutes. She was in town for an ultrarun that was to take place in Silverton this weekend. She introduced herself as Nicole from from Los Angeles, and came up early to acclimate to the high altitudes and check out the route of the run. I told her that I planned to hitch a ride into Silverton to resupply and check the weather forecast. I wanted to take a zero day in Silverton--I felt like I deserved one!--but maybe not if the weather for the next several days was nice but a storm coming fast behind it. Which is when she gave me the bad news--a big snow storm was expected to blow in on Friday and Saturday--two days from now. Up to four inches of snow in the town of Silverton and undoubtedly a lot more than that in the mountains. Noooo!!!! I can't go out in that! It was Tuesday today. I wanted to take a zero day tomorrow--when it was supposed to be gorgeous weather, but if I got back on the trail on Thursday, I'd be out right in the middle of that snow storm. And I had no idea what the weather after that would look like. But I couldn't finish the trail in two days before the snow storm struck either. Shoot! Shoot! Shoot! I didn't know what to do right then, but I'd figure something out. It was basically my worse-case scenario playing out in front of me. 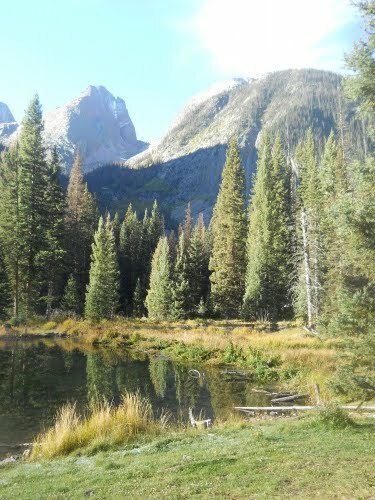 I hoped my getting off at Molas Pass wasn't the end of my hike, but I knew there was a good chance it might be. So close to the end! It's exactly 72.4 miles from Molas Pass to Durango. Just 72.4 miles to the end of the trail. The idea of quitting now... so close to the end. It gave me a sinking feeling. Crap! Why can't I get just four days of nice weather. 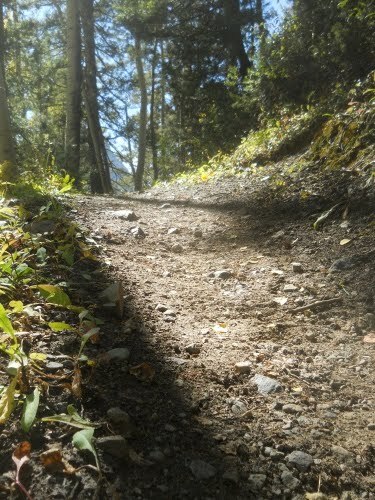 Just four, consecutive days and I'd finish the trail and be done with it. Argh! 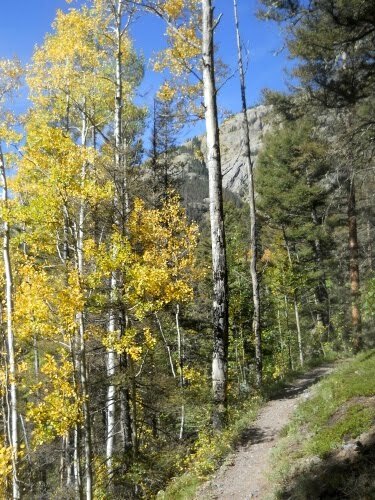 I arrived at the trailhead, set my pack down by my feet and stuck out my thumb. It took all of about two minutes before a car pulled over for me--a young man named Cameron who said he could get me only as far as Silverton since that was his destination. "Perfect!" I told him. "That's my destination!" The highway lead 6.3 miles into Silverton and normally wouldn't have taken long, but there was a delay due to construction work and a section of the highway became a one-lane road with alternating traffic in each direction which slowed us down. But I made it into town, where I picked up my mail drops from the post office and checked into the Blair Street Hostel. I looked in a mirror and I looked like crap. I badly needed to shave. I usually shaved every two or three days while hiking the trail, but with the cold and miserable weather lately, I had stopped and sported about a week of stubble. My nose was sunburned badly from walking through the snow for half the day a couple of days earlier, and my lips dry and cracked despite the weather-proof lip balm with its SPF 15 protection. Actually, it probably made me look worse--you could see it applied in thick layers on my lips. I'm used to seeing myself look like crap during a thru-hike, but I seemed have taken it to a new level this time. 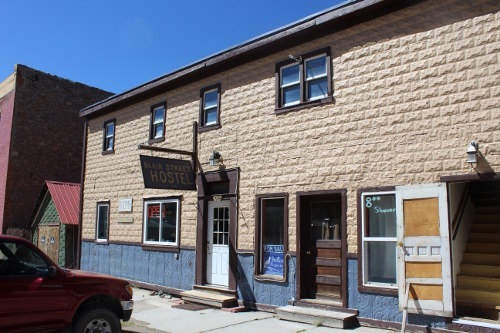 The Blair Street Hostel--my home in Silverton! But a shower and a shave would certainly help a lot, and that's the first thing I focused on. I changed into the spare clothes I had shipped ahead in my maildrop which were clean and fresh and I felt like a new man! I put my dirty clothes into a trash bag which I gave to Jan (the proprietor) for washing. I gave it to her like I was holding a piece of road kill by its tail. "These should probably be burned, but let's try washing them and see how that works," I joked. Nicole--the woman I met near the trailhead--arrived and appeared stunned at my transformation, like I was a totally different person. 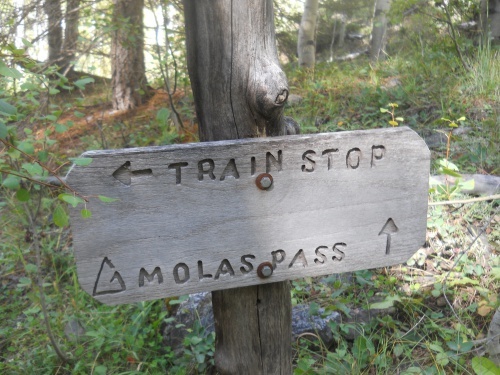 "You're the hiker I met near Molas Pass?!" she exclaimed. Next thing I needed was food--I wanted real food, something that I hadn't been carrying on my back for the last nine days--and a couple of people at the hostel suggested a nearby pizza place which I went to. Delicious, but uneventful! 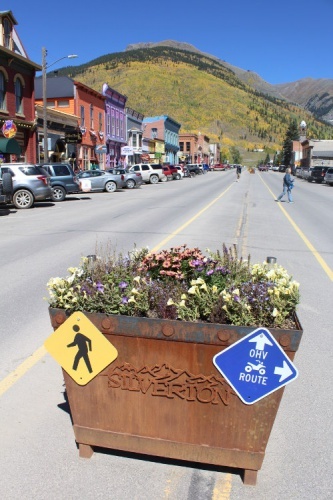 Silverton is an old, historic mining town with just one paved road. (More than one business, I noticed, included directions about being on Greene Street--"the only paved street in town!") The last mine closed in the 1990s and now it's a tourist destination. I was hoping for a before and after photo. All prickly, then smooth as a baby's _____. 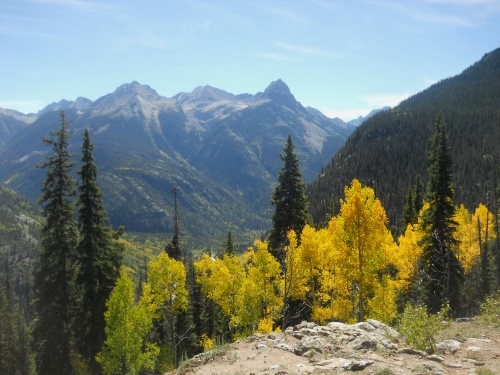 I "grew up" just north of Ouray and Silverton. We spent a lot of time exploring that area, old mines and ghost times, and I've ridden the narrow guage train. So following your trek through this area was a nostalgic blast from the past for me. Such a beautiful area!! The photo of the train looks like it was a toy. Ryan, did you try to pull of the 'doll house effect' with that picture? Maybe it would work...?